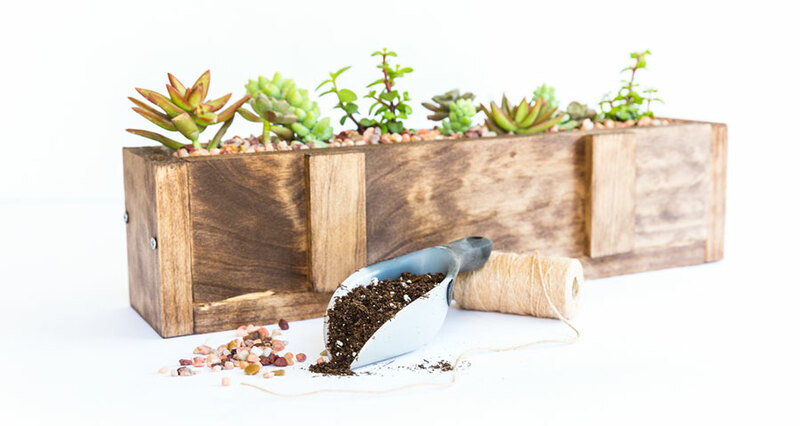 This easy-to-make DIY wood succulent planter is the perfect way to bring the outdoors in throughout these beautiful spring and summer months ahead. With spring underway and summer just around the corner, nothing makes me happier than seeing freshly planted blooms around my home. 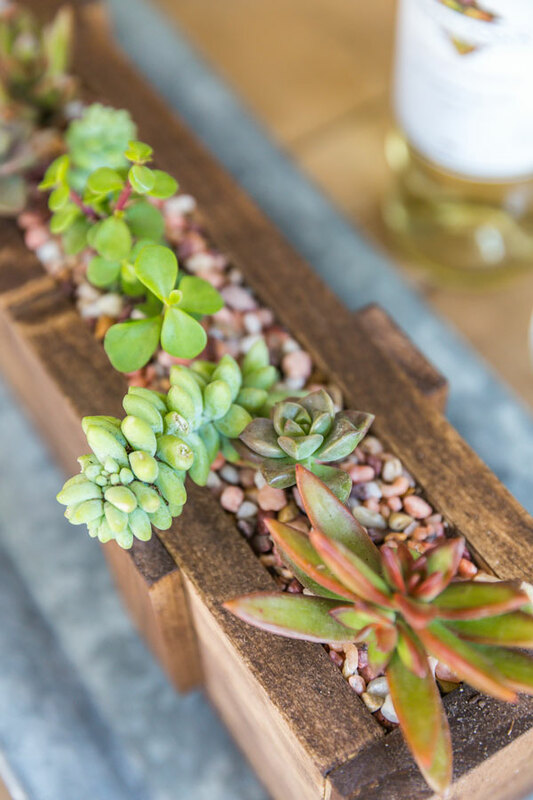 I’m a little biased, but I tend to favor succulents for their desert appeal and ease of care. We can all manage watering a plant a few times a month. 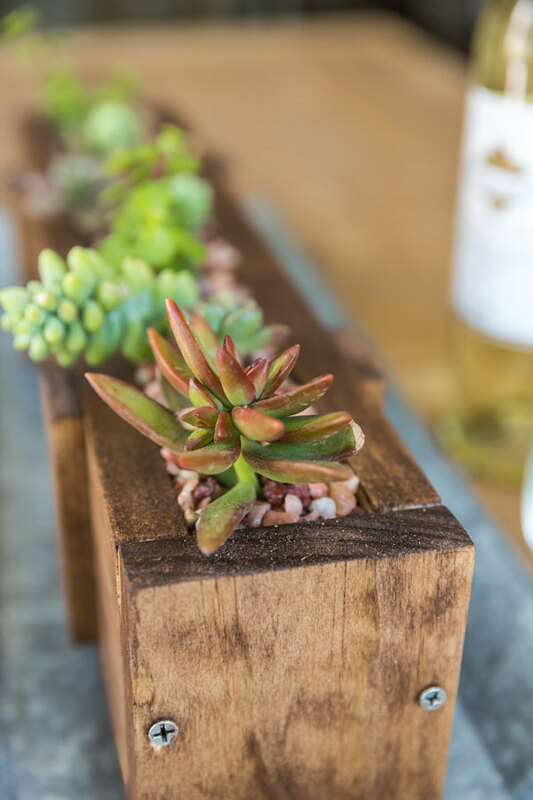 With just minimal knowledge of power tools, you can make this DIY wood succulent planter that makes a great centerpiece for the dining room table. 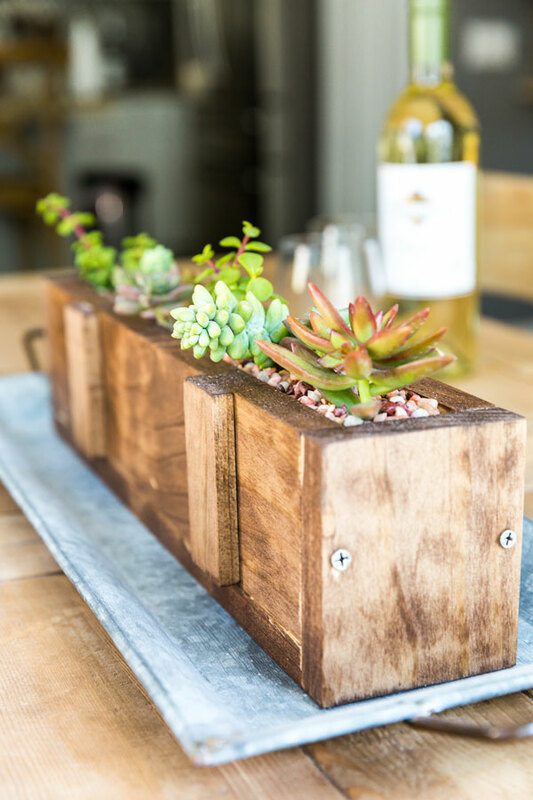 You’ll love this project so much that you’ll start to create succulent planters for all over your home! There’s something to be said for the power of bringing greenery into our homes. We immediately know how they make us feel visually (who doesn’t love the sculptural uniqueness of succulents), but plants gives us health and healing benefits too. It’s just more reasons why we should be surrounding ourselves with the their natural wonders! Picture it now…. friends and family gathering around the dining table on a warm summer night with the succulents on display. 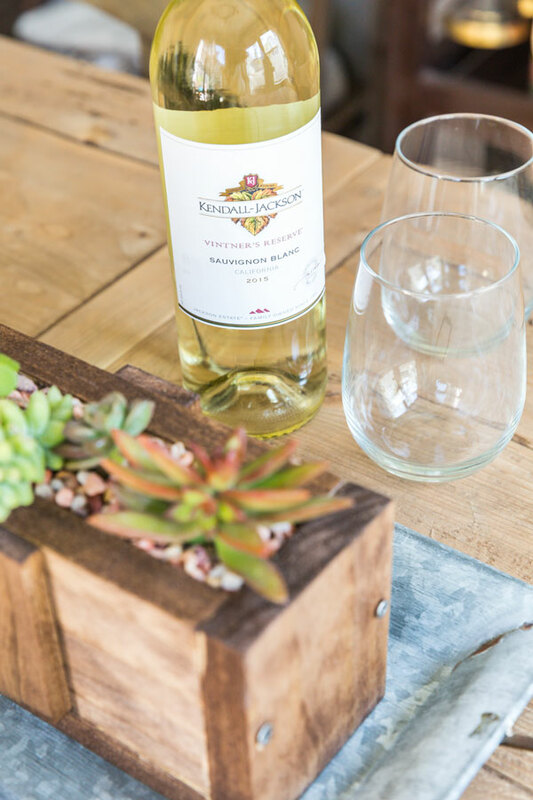 The meal has just finished up & you’re all sitting around laughing, telling stories and sipping on a crisp, aromatic Kendall-Jackson Vintner’s Reserve Sauvignon Blanc. There is a sense of peace; calmness and joy for being surrounded by those you cherish most. It’s in these moments that you truly feel grateful. 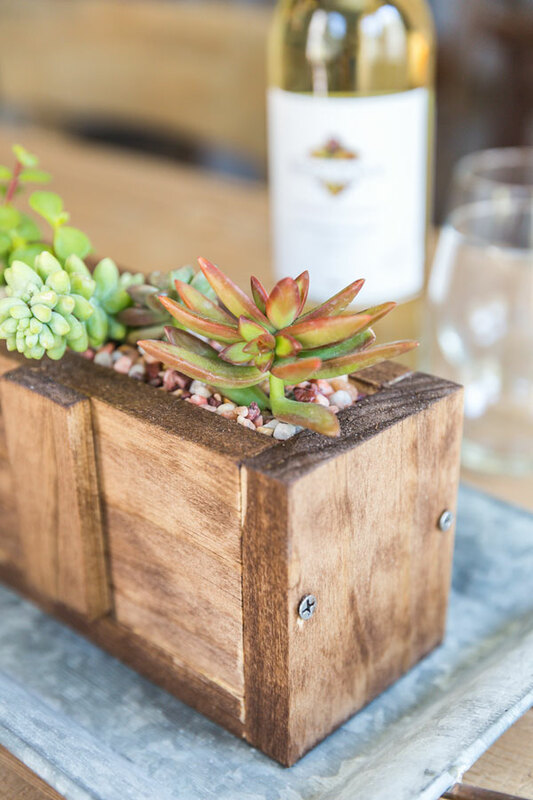 Ok, ok… we love succulents and wine and now let’s get to building this planter box! In all honestly, as long as you have some knowledge of how to work a miter or circular saw (or are friendly with a hardware store employee) and a power drill then you can complete this DIY project. On the 8ft piece of wood, measure and cut 3 - 16” pieces. These will be the bottom and sides of the planter box. With the remaining length of wood, cut the end pieces which should measure 3.5” w x 4.25” h.
With the 36” piece of wood, these small strips are going to be used for decorative purposes on the outside of the box. Trim 4 of these to 3.5” long. Take the palm sander and smooth all edges. Using wood glue, apply a thin layer of glue along the edges (lengthwise) of the bottom piece of wood. Adhere the two sides pieces of wood and let dry (approximately 2-3 minutes). Using a power drill, drill 4 pilot holes on the bottom near the corners. Secure with the wood screws. You should now have a long U-shape that needs just the ends put on. Again, apply wood glue and secure the ends to the planter box. Let dry and secure with (2) wood screws on each end. Apply two coasts of stain, let dry. *Note — do not stain the inside of the box to prevent the soil from being contaminated by the stain. Time to plant. First, apply a shallow layer of pebbles to the base of the planter box. Follow by adding succulent nutrient potting soil until 3/4 full. 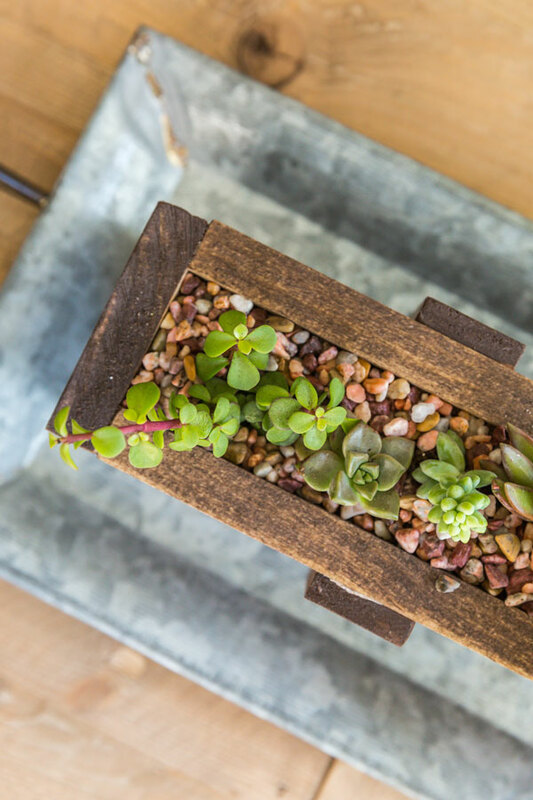 Plant an arrangement of mini succulents. Fill with additional potting soil until 1/8” from the top. Carefully top with pebbles and give a light watering. I suggest having the wine chilling for AFTER when you savor the glory of your wood working skills. 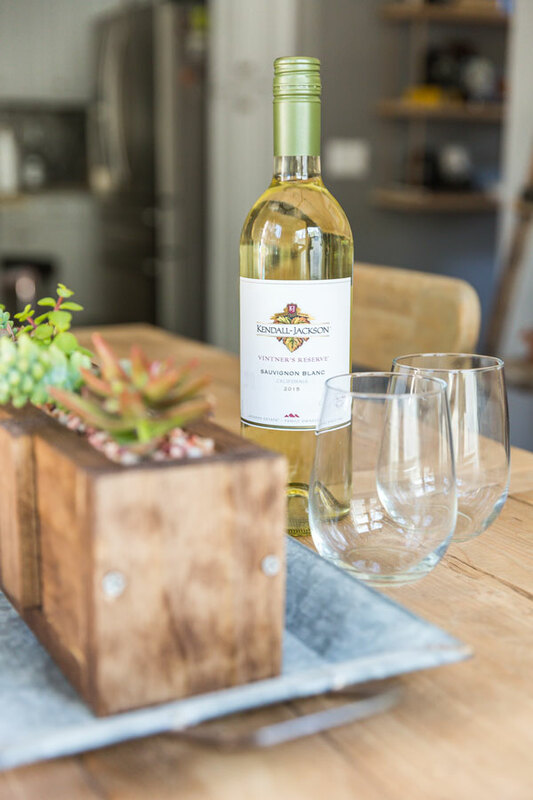 You’ll kick back and marvel at your craftsmanship, sip a little vino and then take photos for all your friends and family to see. Just be prepared because they’re going to want to get their hands on one, but you can just send them back here and instruct them to make their own. Love this DIY project? Pin to save for later or share it with your friends!